Andy Crouch unleashes a stirring manifesto calling Christians to be culture makers. For too long, Christians have had an insufficient view of culture and have waged misguided “culture wars.” But we must reclaim the cultural mandate to be the creative cultivators that God designed us to be. Culture is what we make of the world, both in creating cultural artifacts as well as in making sense of the world around us. By making chairs and omelets, languages and laws, we participate in the good work of culture making. Crouch unpacks the complexities of how culture works and gives us tools for cultivating and creating culture. He navigates the dynamics of cultural change and probes the role and efficacy of our various cultural gestures and postures. Keen biblical exposition demonstrates that creating culture is central to the whole scriptural narrative, the ministry of Jesus and the call to the church. He guards against naive assumptions about “changing the world,” but points us to hopeful examples from church history and contemporary society of how culture is made and shaped. Ultimately, our culture making is done in partnership with God’s own making and transforming of culture. A model of his premise, this landmark book is sure to be a rallying cry for a new generation of culturally creative Christians. 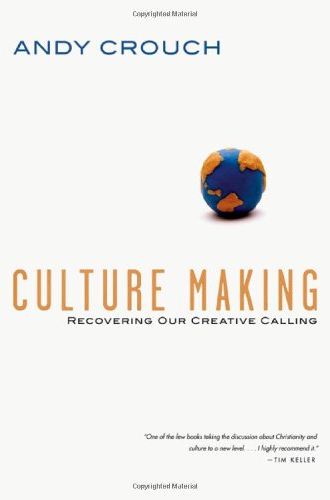 Discover your calling and join the culture makers.